Some days my nose seeks "scent quiet." I'm not speaking of a "quiet scent" but a simple one — nothing complex. It always helps to have single-note colognes (or ones with just a few ingredients) handy, fragrances made with high-quality materials that take simplicity into luxury-land. Last week, I visited the beautiful city of Vancouver, British Columbia, and I started my day there at Nitobe Memorial Garden. 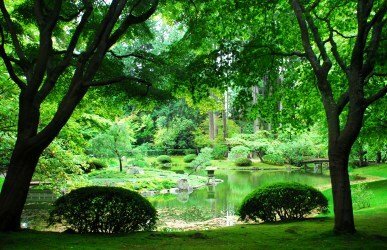 The Zen garden was fresh, washed by a recent rain shower; the beds of moss, evergreens, azaleas, maples, and new blades of iris provided many shades of green. The damp, dim space was made even more romantic by the sounds of birds, streams, and a small waterfall. Only a few "specks" of non-green caught the eye, courtesy of rough stones, bark, weathered wood, cherry blossoms and orange koi. Whenever I visit this garden, I don't want to leave...I want to linger and experience it at night, imagining the stone lanterns glowing from within, the areas around them golden with the light from oil lamps or candles. After this contemplative beginning to my day, it was off to noisy downtown Vancouver for lunch and some retail exercise. I visited with Nazrin at The Perfume Shoppe, bought a bottle of Chanel Pour Monsieur Eau de Toilette (not available in the U.S.) and while browsing at Holt Renfrew's men's cologne boutique I smelled something wonderful in the air. My nose shouted, in recognition, "VETIVER!" and my eyes zeroed in on the fragrance counter where I saw a stout bottle of Ermenegildo Zegna Essenze Haitian Vetiver. Sure enough, that's what I was smelling. Vetiver is one of my favorite notes in perfumery and I was lucky to be shopping with a friend who also loves vetiver; in India, my friend's mother wore unadulterated khus (vetiver) oil — it was her signature scent, worn especially on furnace-hot days in Delhi. My friend and I smiled as we sniffed my Haitian Vetiver-doused arm. Haitian Vetiver is the sixth fragrance in the Ermenegildo Zegna Essenze collection, six perfumes based on six "star" ingredients (Italian Bergamot, Florentine Iris, Indonesian Oud, Javanese Patchouli, Sicilian Mandarin) and all contain a dose of "Zegna bergamot" (from a bergamot orchard whose output is controlled by Zegna). Haitian Vetiver starts off with a wave of bergamot, followed closely by rich vetiver, vetiver that's accented with even more rootiness (thanks to carrot seed/orris) than it possesses on its own. Subtly twinkling, and enlivening the vetiver, is a touch of neroli. 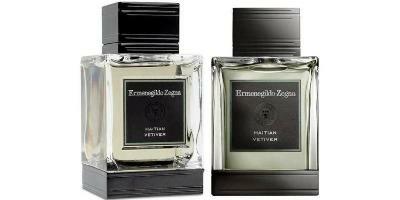 The focus of Haitian Vetiver IS vetiver: vetiver enshrined amidst "blurred" aromatic offerings. The moment I wore Haitian Vetiver I knew it would be perfect for a "scent-quiet" day; it's a "Zen garden" perfume. I love Haitian Vetiver and am considering buying a bottle — at the moment I have "only" three vetivers in-house: Frédéric Malle Vetiver Extraordinaire, Lalique Encre Noir and Maître Parfumeur et Gantier Route du Vetiver (my all-time favorite vetiver). Like those vetiver scents, Haitian Vetiver feels dressy but relaxed..."dressy-casual? "; its character is somewhere between vintage Guerlain Vetiver and Vetiver Extraordinaire, but it has more buoyancy and sparkle than either of those perfumes. If your perfume cabinet is full of vetiver fragrances, you may not need Haitian Vetiver; sniff before you buy. If you "know" vetiver inside-out, adore it, and need a great vetiver scent: I recommend Haitian Vetiver. Ermenegildo Zegna Essenze Haitian Vetiver has good lasting power and close-to-the-body sillage; it's $195 for 125 ml and is available at select Neiman Marcus and Barneys New York stores, or at Bloomingdales and Ermenegildo Zegna boutiques. Watch the very Italian (slightly sentimental/theatrical) video for the Essenze collection here. Note: top image is Nitobe Memorial Garden via Wikimedia Commons. long time no post, but this sounds fantastic enough to splurge on! Chandler: geesh…I’ve splurged too much in the last few weeks! Something about summer weather makes me want to BUY. I hope you can sniff the entire line. That’s a very nice review. You never know until you try, do you? I like the Guerlain and the Malle, also Nicolai’s Vetyver, although her curried note does not hit me the right way every time. Off your central subject, I just bought Pour Monsieur in the Paris airport, was glad I was already sure which version to choose, as the “Concentree” was offered as well. But in a fit of prudence, or parsimony, or something, did not buy Habit Rouge EDP after having read your account of it a while ago. I can say you are right, it is markedly different and very appealing. Stupid not to have sprung for it. I’ll make up for the error next trip. And: Here’s to Chandler Burr, whose Emperor of Scent started me on the fragrance trip. Donnie: must have been on your way home? I always pass up “offers” then at the airport by thinking how much money I’ve already spent. HA! I’ve missed out on a few goodies that way too. Have you tried Florentine Iris from this line? And “only” three vetivers sounds dangerously low… I think you need to buy Haitian Vetiver! Janice/Galbanum: I’ll review it very soon. Hey Kevin , what happened? You never did get round to posting the promised review of the Florentine Iris ! I love vetiver as a supporting note, but have not yet ‘fallen’ for a scent that puts vetiver front and centre (unless Terre d’Hermes is such a scent). From what I have read it seems that Sycamore is considered the highpoint of vetiver perfumery, so I was surprised that it does not feature in your vetiver triumvirate! Merlin: not because I don’t love it though…it and Haitian Vetiver are close relatives…I’m sure a bottle of Sycamore is in my future. That would then make it 5 vetiver perfumes, while you only feel the need for 1 amber at a time. Really now, I think you need to re-examine your priorities! M: true…there are about 7 amber hopefuls on my list! That’s a good observation. I tend to think of Terre d’Hermes in the vetiver “extended family” as I do Chanel 28 la Pausa. “somewhere between vintage Guerlain Vetiver and Vetiver Extraordinaire” sounds just about perfect! Must sniff but would only need a decant. I am a vetiver fiend and have AG Vetiver, CSP Haitian Vetiver, various vintages of Guerlain Vetiver, MPG Racine, 28 la Pausa and LesNez Turtle Vetiver Front and Back, plus dozens of vetiver samples and decants. My fav depends on the season but AG Vetiver is my first love. Oddly, I don’t like Vetiver Tonka or Sycamore. I probably would have bought FM Vetiver Extraodinaire had I tried it earlier on. Love your “retail exercise” It sounds so healthy! NozKnoz, what do you think of Vetiver Oriental by Lutens? I’m aware the style is quite different! Merlin, that’s another one that I don’t care for. Didn’t like L’AP Coeur de Vetiver Sacre, either. Oh, and another good “extended family” one is Etro Shaal Nur, although I have to say I haven’t tested a recent version. Very descriptive and evocative review, Kevin. I was right there in that garden with you. I haven’t wanted to try a new scent in forever, but his sounds beautiful. Like your friend’s mother, my favorite vetiver is a few drops from a very old bottle of vetiver essential oil. rappleyea: it’s warm and MUGGY here today, Haitian Vetiver would hit the spot.